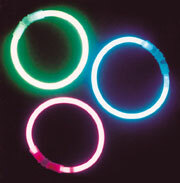 Glow bracelets that come packed 50 to a tube. $6.00 per tube for 24 tubes or more. $5.40 per tube for 48 tubes or more.